Schools from Bogalusa, Louisiana to Columbia South Carolina and all points in between made their annual pilgrimage to Camp ASCCA in Jackson's Gap, Alabama for the Southeastern Region, Atlantic-Pacific Tang Soo Do Federation Black Belt Camp. Grandmaster John St. James and the 12 Masters from the region’s schools provided expert training, motivation, and oversight of the weekend’s activities. The Atlantic-Pacific Tang Soo Do Federation’s Southwest Region held its 6th annual Dan Shim Sa (black belt test) and Championship Tournament 19-20 October, in Albuquerque, NM. Thunderbird Martial Arts was the gracious coordinator for this Federation-hosted event at the Boy’s and Girl’s Club of Central New Mexico. Kwan Jang Nim John St. James traveled from Atlanta, Georgia to host. The Atlantic-Pacific Tang Soo Do Federation’s Southwest Region held its 5th annual Dan Shim Sa (black belt test) and Championship Tournament September 29-30 in Albuquerque, New Mexico. Kwan Jang Nim John St. James traveled from Atlanta, Georgia to oversee the event. Kwan Jang Nim St. James was joined by Sunim Sabom Nim Mark Farquharson, who traveled from Aurora, Colorado. Regional school owners, and their students, from Thunderbird Martial Arts, Albuquerque, NM; Colorado Tang Soo Do, Aurora, CO; Abilene Karate Academy, Abilene, TX; and Cornerstone Martial Arts & Leadership Academy, Arlington, TX made the trip to participate. The event was hosted by Mr. Tom Witterholt, Bu Sabom, of Thunderbird Martial Arts, and the venue was The Boys & Girls Club of Central New Mexico. Serve, Lead and Inspire! This was the theme for the 2017 Kodanja (Master’s Clinic) and the New England Regional Black Belt Camp held at Springfield College in Springfield, Massachusetts from June 23rd to the 25th. This year was the first Kodanja which was held at Springfield College and it was one to remember for the ages. The two separate events shared some venues on campus and yet there were two distinct schedules and no shortage of valuable instruction. It was a real treat! The Atlantic-Pacific Tang Soo Do Federation’s Southwest Region held its 4th annual Dan Shim Sa (black belt test) and Championship Tournament 23-25 September in Lubbock, TX. Kwan Jang Nim John St. James and Kuktche Sabom Nim Debbie Jett traveled from Atlanta, Georgia to oversee the event. Additionally, Sunim Sabom Nim Mark Farquharson traveled from Aurora, Colorado and Sabom Nim Peter Estrada from Abilene, Texas to help, as well. Regional school owners, and their students, from Thunderbird Martial Arts, Albuquerque, NM; Colorado Tang Soo Do, Aurora, CO; Abilene Karate Academy, Abilene, TX; and DFW Tang Soo Do, Ft. Worth, TX made the trip to participate. The Southwest Region of the Atlantic-Pacific Tang Soo Do Federation held its 3rd annual Dan Shim Sa (black belt test) and Championships November 13-15. Kwan Jang Nim St. James, International Master Deborah Jett, and Senior Master Michael Jett traveled from Atlanta, Georgia to help host activities. Senior Master Mark Farquharson traveled from Aurora, Colorado to help as well. Regional school owners and their students from Thunderbird Martial Arts, Albuquerque, NM; Colorado Tang Soo Do, Aurora, CO; Abilene Karate Academy, Abilene, TX; and DFW Tang Soo Do, Ft. Worth, TX; made the trip to participate. West Texas Karate, Lubbock, TX, hosted the weekend’s events. 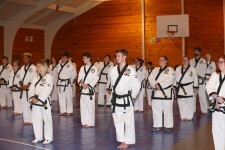 The Southwest Region of the Atlantic-Pacific Tang Soo Do Federation hosted its first Leadership Camp from June 12-14. The Leadership Camp was held at Plains Baptist Assembly in Floydada, Texas with 75 in attendance, including masters, instructors, instructor assistants, and students from the region. The weekend was kicked off with a dan shim sa (black belt test) on Friday night. While the dan shim sa was taking place, non-testers enjoyed an early dinner, and training in open hand forms and hand techniques. This first year’s theme was, “Build. Grow. Lead.” as the region focused on building and growing future leaders of the Federation. "Tang Soo Do Rocks the South Plains Again!" “Tang Soo!” was heard shouted across the South Plains starting on November 20th and going right through the weekend of November 21st, 22nd, and 23rd, 2014. The actual festivities started with a Leadership escrima class taught by International Master Debbie Jett, 6th Dan to well over 50 attendees. This class was followed by a Leadership presentation to an equal sized group of students and parents by Grandmaster St. James and covered lessons he has learned from a lifetime of leading.